Graham Johnston sends us the first picture from Otago. 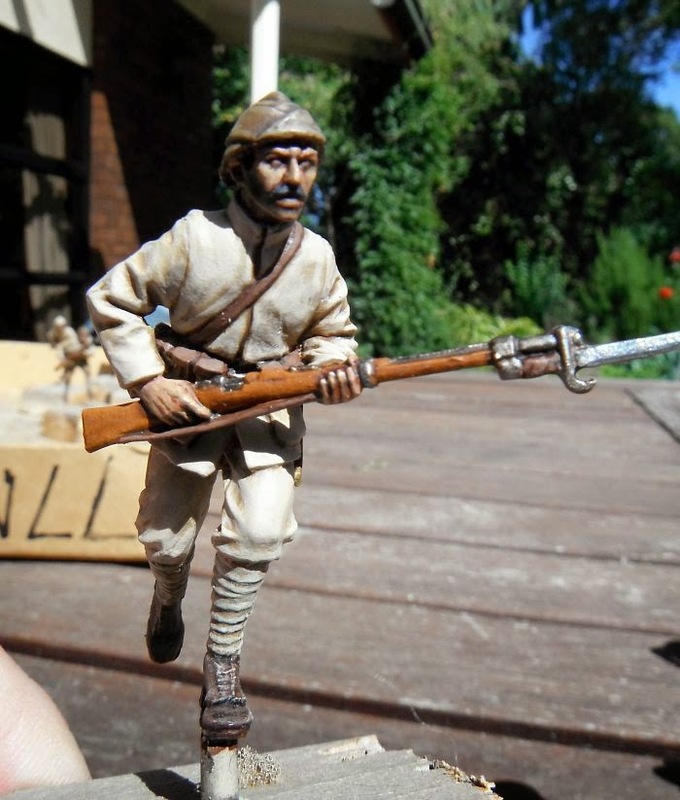 His Turk really conveys the look of an Anatolian villager turned soldier. As Les Carlyon says in his book Gallipoli, the Turkish soldiers "didn't expect much from life; they were used to being misused by corrupt leaders. But in defence, they knew how to hang on, to endure, to swallow bad food and go barefoot, to baffle and frustrate the enemy with their perversity and their serenity in the face of pain and death." And carrying on with our theme of somewhat unusual helpers, Graham goes on to say: "Here is my messy work site with assistant painter. She is pretty good on a quick lick of paint, then the mean dry brush. Unfortunately the fine details have taken some time extra."